Hannah Wang appeared on Show 280, recorded in November 2013, at age 17. The Gerdes and Wang Piano Duo is coached by Paul Nitsch at Queens University of Charlotte Music Academy. The members include 17-year-old Clara Gerdes from Davidson, North Carolina, and 16-year-old Hannah Wang, from Charlotte, North Carolina. 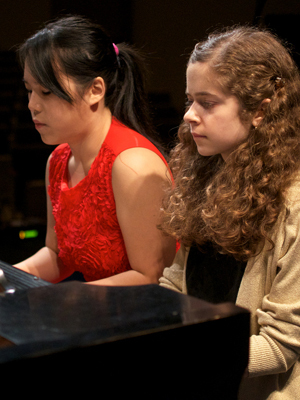 The duo were the state, regional and national first place winners of the 2012–2013 Music Teachers National Association Senior Piano Duet Competition. Clara plays weekly at her church and enjoys English literature and poetry. Hannah in interested in traditional Chinese music and instruments and is also Captain of her school’s debate team.